Marcella Pattyn died at the age of 92 on April 14 in Kortrijk, Belgium. Lacemakers are not likely to have heard of her, yet with the passing of this extraordinary woman we reach the end of an ancient tradition. She was the last Beguine. 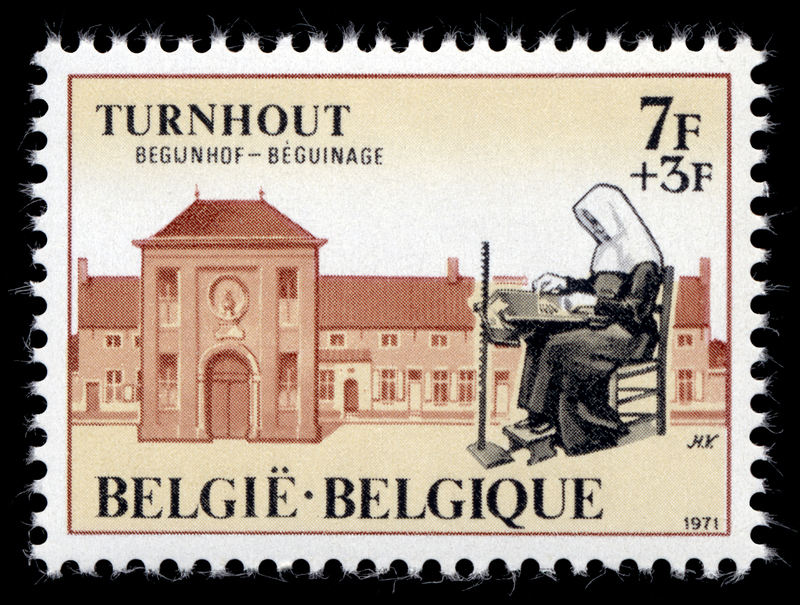 The Beguines were a group of lay sisters associated with the Catholic church, most active from the 13th through 16th centuries. At that point many groups were suppressed in the Protestant Reformation, and others did not long survive the subsequent turmoil of revolutions. Yet beguinages endured until the 20th century in places like Bruges, Lier, Mechlin, Leuven, and Ghent, which had nearly 1,000 members in 1900. 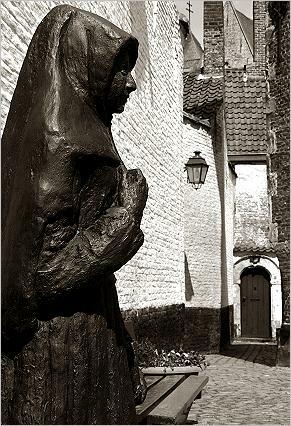 Juffrouw Pattyn lived at the St. Elisabeth Beguinage in Kortrijk, where her statue stands in memory of this great tradition. 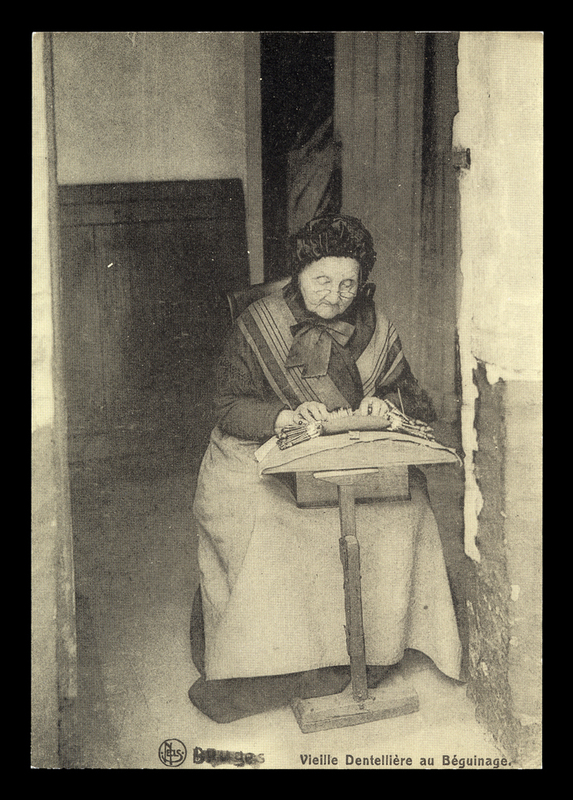 Virtually blind, her life as a beguine began at age 21, and was spent in contemplation, good works, and music. 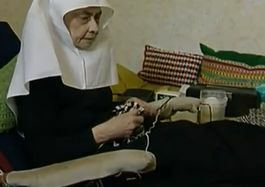 In keeping with the tradition of the Beguines, she was also a weaver. 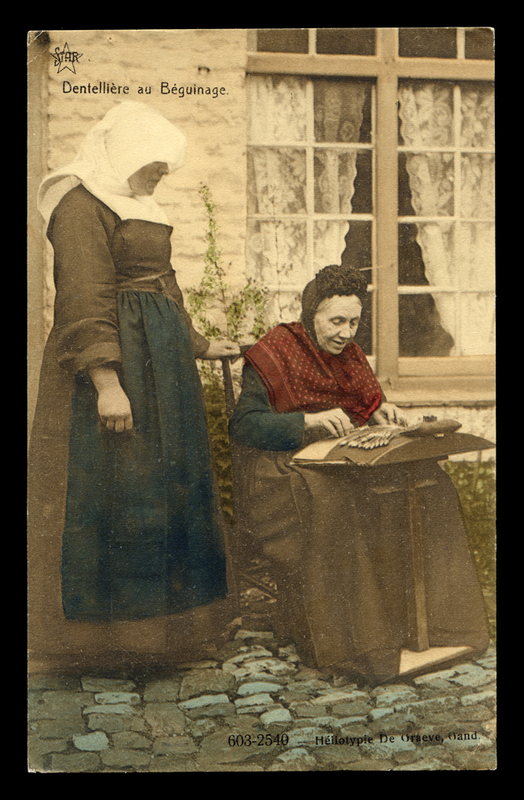 What we as lacemakers must not forget is the contribution the Beguines made to lace. 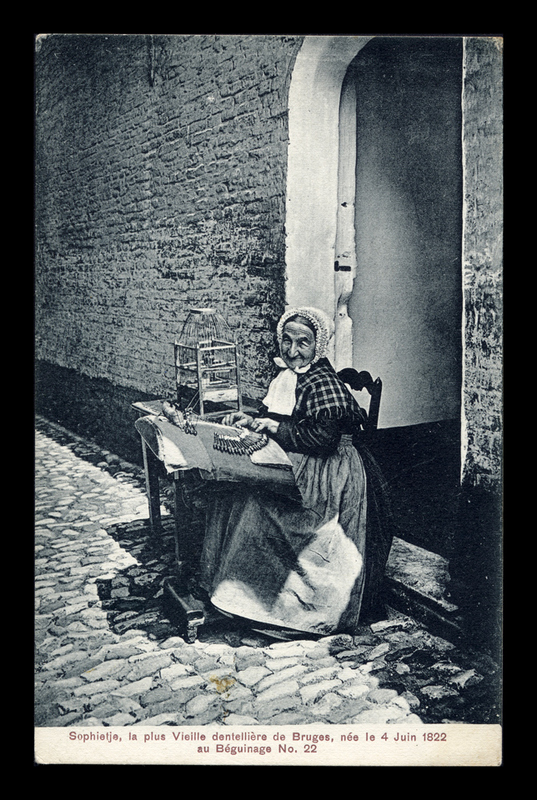 Postcards of the early 20th century are full of images of lacemakers in the beguinage setting (see below). These women lived in independent communities, making their own living, often in the textile industries. Lacemaking was a vital activity, carried on at a high level of quality. It is time for someone in the lacemaking community to delve into this subject, recover what history is left, and document it before it is forgotten. 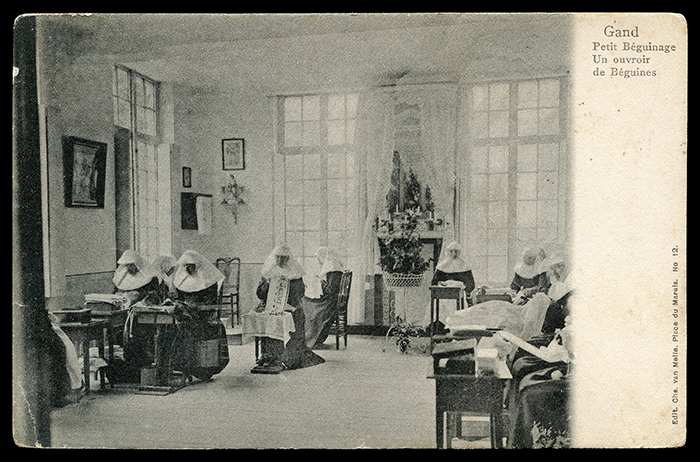 The women making lace in the last row of postcards are not Beguines, but elderly women living in the the largely vacant, very beautiful Beguinage housing. Read more about Marcella Pattyn in the Economist obituary, http://tinyurl.com/brftndp. This entry was posted in In Memorium. Bookmark the permalink. Thank you for this important entry on Marcella Pattyn. Thank you for sharing this fascinating article Laurie. Interestingly Norwich, Norfolk is the only English city where there is definite evidence of a beguinage – today it is known as the Briton Arms which stands in the corner of St Peter Hungate Church on Elm Hill making it a unique survivor. Its a three-storied timber frame building and last year it was being re-thatched. Current use is a delightful cafe/restaurant and it’s probably Norwich’s oldest continuously occupied building. If you’re ever visiting it’s worth a look – and the food is good too.